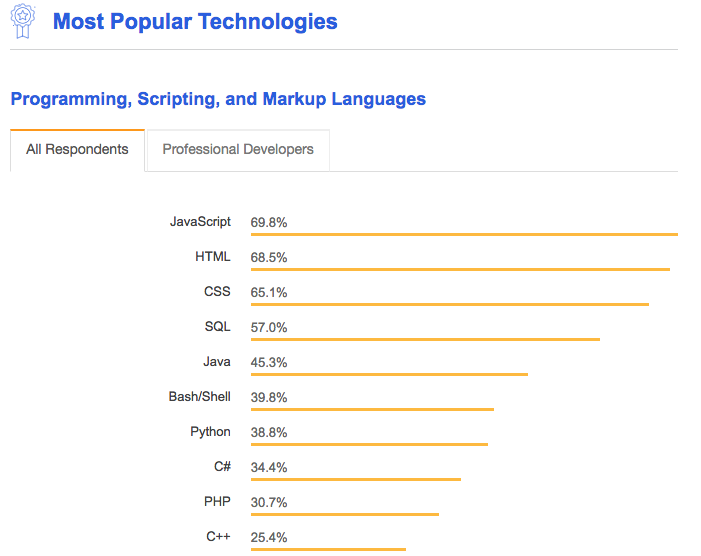 Since 2011, Stack Overflow has asked developers about their profiles, their favourite technologies, coding habits and work preferences as well as how they learn, share and level up. This year, a record number of developers participated in the Stack Overflow Developer Survey 2018 - more than 100 000 developers across the globe. In this blog post, we highlight some of the major insights from 2018 compared to previous years. A common misunderstanding is that developers have been programming since the day they were born. 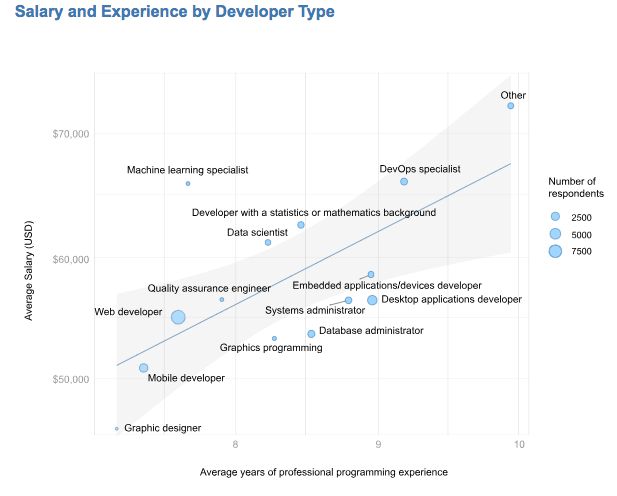 Of course, there is a wide range of experience levels in the development community. 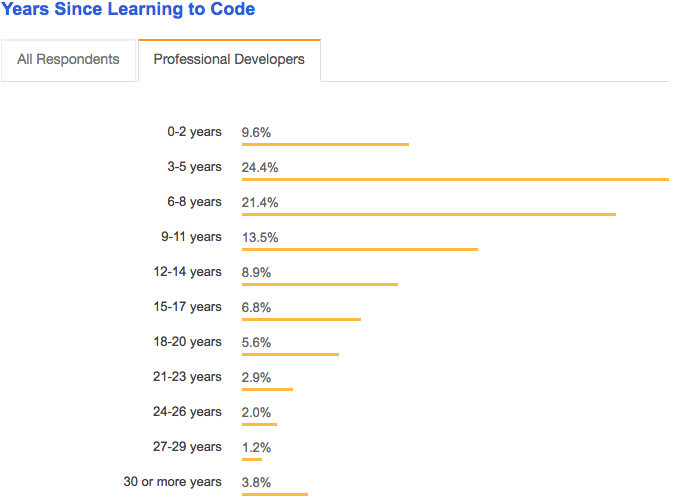 In the 2018 survey, as many as 35 % of the professional developers stated that they learned how to code within the last 5 years. In the 2017 survey, the same number was only 19 %. There has been an (major) increase in the part of the developers who works professionally as developers, and learned how to code within the last 5 years. Could this be a sign of a need of developers in the labor market? Employers are ready to hire developers even if they learned how to code just recently. Picture from Stack Overflow Developer Survey 2018. Generally, there is an over representation of males in the tech industry as well as within the developer community. This is highly visible in the Stack Overflow Developer Survey of 2018. Of all respondents, only 6,9 % were women. However, the number of females were slightly higher among the group of students, 7,4 %. The share of females in the previous year barely showed any difference. There is a higher percentage of females in the group of students, than the overall group of respondents. Is this an indicator that the percentage of females will increase when the students join the work force? The incredible growth of Python probably depends on several independent factors. First, it is easy to learn and use. Secondly, there is a huge supportive community with plenty of documentation, guidelines and tutorials. Thirdly, machine learning is a growing trend, and a lot of developers use Python for machine learning projects. Lastly, Python has a great corporate sponsor behind, Google. You can read more about the massive growth of Python at Stack Overflow blog. For the first time in the history of Stack OverFlow Surveys, the topic of AI was introduced to the respondents. Generally, developers are optimistic about the future potential of AI. However, the developers are not aligned when it comes to responsibility of ramifications of AI. Of the developers, 47,8 % believe the responsibility of the ramification of AI belongs to the creators of AI, while 27,9 % believe this responsibility relates to the government. Photo from Stack Overflow 2018 Survey. This topic will be very interesting to follow the upcoming years. How will the general approach to AI in the developer community change? Will the developers always have a positive approach to AI? These priorities seem to have been more or less consistent when comparing the 2018 survey to 2017 and 2016. Generally, the more years of experience you have, the higher salary you will get. This is the case in the developer community as well. However, there are some exceptions. 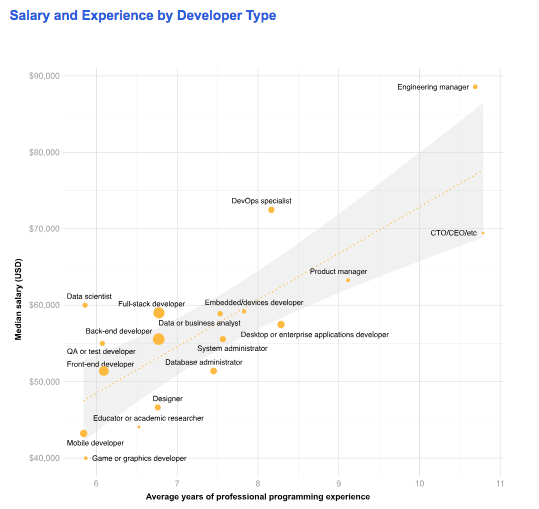 Within in the last year, there has been a particular change in the correlation between average years of professional programming experience and average salary for two types of coding work: DevOps specialists and Data scientists. In the picture from 2017, the Data scientists and DevOps Specialists are within, or very close, to the correlating pattern (grey area). Picture from Stack Overflow Developer Survey 2017. In the picture below, it is possible to view the same developing roles as above. However, please note how far out Data scientists and DevOps specialists are from the general correlating pattern. For Data scientists, could this be a consequence of the hype around big data in today's digital society? Another possible explanation could be that it's a quite young profession designation. And for DevOps specialists, could this increase in salary vs experience be related to supply and demand? Only around 10 % of this survey's respondents consider themselves as DevOps Specialists. Do you have any thoughts or want to discuss the findings with us? Feel free to get in touch with us through our pages at Twitter, Facebook or LinkedIn. Or just send me an email at sofia.bjorklov@matchmore.com. And by the way, don't forget to try our beta for free here. We highlight four promising tech events in June, 2018 in Europe, which we believe will bring a lot of value. By attending tech events you are able to stay updated with the latest trends and technologies, you can expand your network as well as present your ideas to peers and gain valuable feedback. We gained a lot of valuable insights from the tech events we attended in the month of April. It is now time to outline the tech events we plan to participate in May. There is one very niched this month! Click and read!